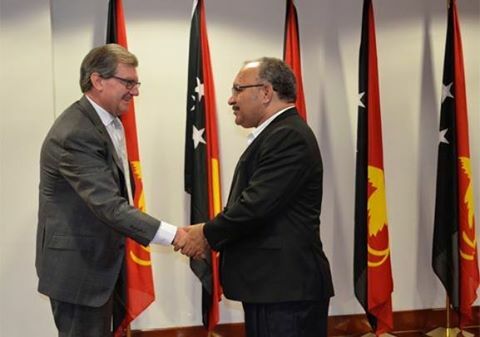 The Prime Minister Peter O'Neill has thanked Australia for its ongoing support to Papua New Guinea’s plans to host APEC in 2018, saying policing and Defence co-operation is an important part of APEC planning and ongoing security capacity building. During a courtesy call by Australia’s High Commissioner to Papua New Guinea, H.E. Bruce Davis to the Prime Minister today in Port Moresby, a range of issues were discussed that also included the Manus Regional Processing Centre and programs to deal with health issues such as tuberculosis. PM O’Neill further thanked Australia for maintaining its engagement through the Papua New Guinea-Australia Policing Partnership. “There had been discussion that the policing partnership with the Australian Federal Police was a bout to be wound back, but this will not be the case. “The contingent of 73 AFP will continue both in their current roles of helping to enhance RPNGC cavity, and in support of APEC planning. The Prime Minister said overall APEC logistics and policy development plans are progressing and on target to reach their completion dates, and high level focus will continue to be maintained on security efforts. “Plans have advanced well so far to ensure that we have the right level of accommodation, that our venues will be ready and our road system working. “Our biggest concern, as it is for any APEC meeting, is security. “Every APEC year is a joint security operation between the Host and visiting countries, and our year will be no different. “Threats to APEC meetings can come from a range of sources and, as APEC Host, we must be ready. “APEC security requires a comprehensive package of elements covering land, air and sea, together with more modern considerations such as cyber security. “Through 2018 Papua New Guinea will receive visitors from APEC’s 20 other member economies, from Pacific island nations, and other delegates from as far away as Europe. “This includes Prime Ministers and Presidents, all with their very own security concerns. “The heads from some of the largest companies in the world will also be in Port Moresby for the APEC CEO Summit in November. “The path ahead to reach our objectives is long and challenging, but the timeframe to achieve this is short. On other issues discussed during the courtesy call, the Prime Minister said plans to close the Manus Regional Processing Centre are ongoing. The Prime Minister and High Commissioner further discussed current efforts to combat tuberculosis. “TB is an ongoing concern, particularly in areas of Gulf and Western Province, and we will work with Australia on new initiatives. “Importantly, our Government is looking at new measures that encourage people to complete their course of medication. “Too often we hear of people who have not completed their full course of TB drugs, become multi-drug-resistant and in the end they have died.